Early Literacy Messages in Action! When the lovely Lindsay from Jbrary started tweeting about organizing a blog tour for early literacy tips, I knew I wanted to be a part of it. I started brainstorming ideas and trying to decide what I wanted to say. 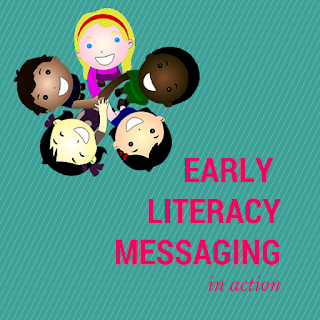 There is so much that I love to say about early literacy, and it can be hard to get it all in one blog post. I decided to do a top 5 list (because I'm obsessed with lists) of things I wish I knew about early literacy tips when I first became a librarian. 1. Make it fun! I think this is the most important thing to keep in mind when sharing early literacy tips. If caregivers feel like they're being lectured, or spoken down to, then they're not going to pay attention to you. Or worse, they're going to feel like you don't respect them and their parenting choices. I share "Fun Facts!" with my caregivers instead of calling them early literacy tips. To me this makes it seem less like a student/teacher relationship and more "We're all friends!". Also, make sure the tips you're sharing are fun. No one, other than your other librarian friends, want to hear all about the statistical data you found. Instead, I always try to make it short and sweet. My goal is to give them useful knowledge that they'll remember and also share with their caregiver friends. For example, because of all the Jurassic World excitement, I read a dinosaur book at my under 2's storytime. The book "Dinosaurs" by Simms Taback includes the name of real dinosaurs like Triceratops, Tyrannosaurus Rex, and Brachiosaurus. After reading a few pages my "Fun Fact!" was, "Saying the name of hard words and not simply skipping them is really important for little ones. While saying scientific names of dinosaurs might seem silly, you're building their vocabulary!" 2. Interact with your caregivers. A great way to make your early literacy interactions less awkward is to know your audience! Talk to them before and after storytimes. I start each storytime with introductions and this usually breaks the ice with the group. Also, you might be surprised by how many questions your caregivers have for you. Questions that might even lead you to your next "fun fact" to share at storytime! 3. It's ok to not have a tip in every single storytime. This is so important! Don't feel pressure to give out an early literacy tip at every single storytime. Especially if you are working in a new place, age group, etc. Read your crowd. If it's going to seem awkward or forced then just skip it that week. If two kids in the room are howling and another one is running in circles, maybe it's time to start a song instead. You can always try to insert a tip later if the timing seems right. You can also completely change the tip you were going to share. One week I had planned to talk about colors, but when I lost my voice due to allergies I decided to talk about singing instead. "Singing, even if you think your voice is the worst, is a great way to bond with your little one. Your child loves your voice, and they don't care if you have perfect pitch!" 4. You're allowed to give tips if you're not a parent. This was a hard one for me at first. While I love my job and love researching early literacy, I don't have any children. Why would caregivers listen while I tell them how to raise their child? The key is that you're not telling them how to raise their child. You're simply giving them information about how to develop the skills their child needs to get ready for reading and writing. You're never judging their parenting or telling them they're doing something wrong! 5. Be confident in your knowledge. There's a reason you're doing your job! You're an expert! Make sure you know the information that you're sharing with your caregivers. Research it and make sure there is information to back it up. Plus, really delving into the research behind your early literacy tips will just make you more knowledgeable about the topic! You might even find your tip for next week's storytime while you're investigating. 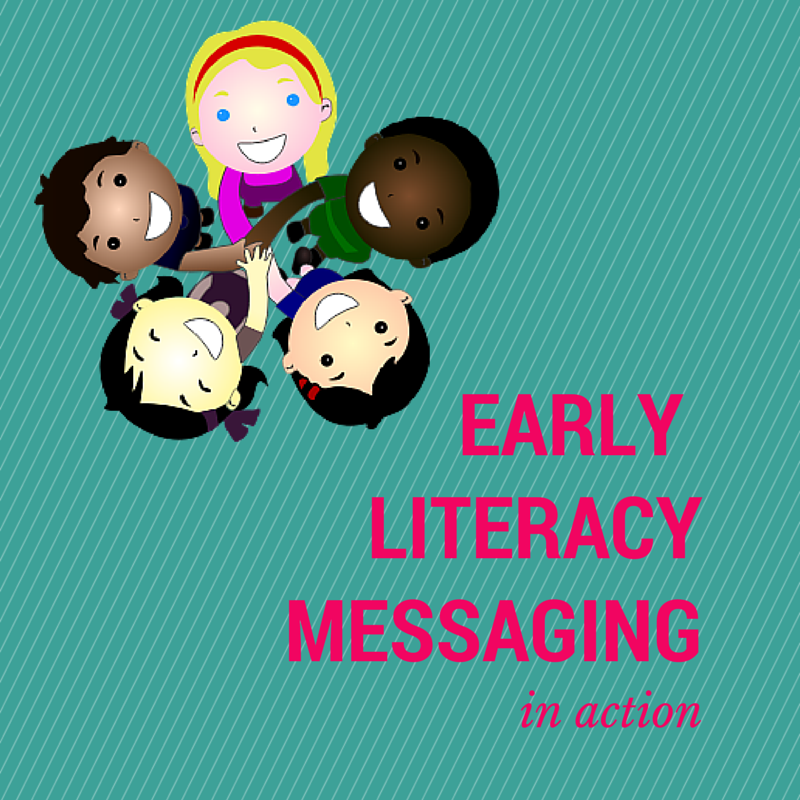 How do you share early literacy messages? Tell me your tips! Also, be sure to check out a round up of all the great early literacy posts on Jbrary at the end of the week!